Is Your Company Website Self-Service? 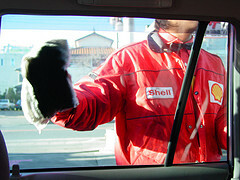 Meanwhile, an attendant filled up the gas tank, washed the windows, and checked the oil. That was full-service. You see, my Mother wore a dress to church and didn't want to smell of gas fumes the rest of the day. I was too young to pump the gas. She barely allowed me to mow the lawn on my own until I was 15. And that was with a push mower. By now you may be asking yourself, where is he going with all of this? Here's the thing. Today, we live in a self-serve world. The days of full-service gas stations are long gone (except for Oregon and New Jersey where it's a law that you can't pump your own gas). For example, at the grocery store, many of us prefer to use the self-serve checkout kiosks when purchasing only a few items. And how often are you in need of help, yet you still avoid talking to sales floor reps at a department store when they ask, "Can I help you?" Why do we buy online instead of in a physical store? Several reasons, really. But on this theme - the physical store no longer offers service. Not to mention it's much quicker to do a Google Shopping search on a new product than walking up and down the aisles of a department store in search for what you need. Oh, and you mean I have to wait on that long line to checkout too? We used to be able to go to the local hardware store for advice on how to fix the slow leak under the kitchen sink. Now we research online for probable causes and simple fixes. You'll also find more valuable information in online customer reviews of products than speaking with an often, untrained sales floor rep. This is an opportunity for your website to be everything the physical storefront is not. Today's culture doesn't want to interact with people who will waste their time -- i.e. telemarketers, uninformed sales reps, technical support that suggests the mundane, simple fix tasks before upgrading you to a technician who can actually help. Let your customers help themselves and find what they need on their own! Does your site offer a powerful search tool to get the visitor to where they need to go the first time? Does your e-commerce site allow customers to write reviews of your products? Is there a live chat option for customers who need technical support on your products? What about live chat for customers with questions before they checkout? Do your online forms for lead generation require a phone number? Why? If your leads prefer to be contacted via phone, they will leave you their contact number, just don't require it. After all, 77% of people today prefer marketing communications via email. Does your site educate the customer? Do you have a blog to establish your company as an authority on your industry, products or services? Provide all of the resources needed to let your customers explore your site, company, products and services on their own. Not sure where visitors may be running into trouble? Check the bounce rate for all of your pages. Is there a specific page with a strikingly high bounce rate? Simplify it. What about your high quality content downloads or shopping carts? Are people abandoning your site when you ask for them to sign-in/up and provide to you a multitude of information? Consider using social sign-in or allow for them to checkout as a guest. We live in a self-service world. Please, simplify your processes so your customers can save time, find what they want easily, and (we mean this in the nicest way possible) don't have to talk to you.